After first chatting on this blog a couple of years ago, Perry Dyball has been back in touch with me to announce he’s resurrected an old programming project of his: “Super Air Raid” for the Camputers Lynx! This entry was posted in Uncategorized on June 12, 2017 by jynxemulator. Since I released the PI version of Jynx, I‘ve been chatting to Russell, moderator on the Raspberry PI forum, who posts as ukscone. Hey – did I pronounce “scone” right? Russell has given me permission to link to his website which contains Lynx-related resources. This includes the User Manual! This entry was posted in Uncategorized on July 8, 2015 by jynxemulator. 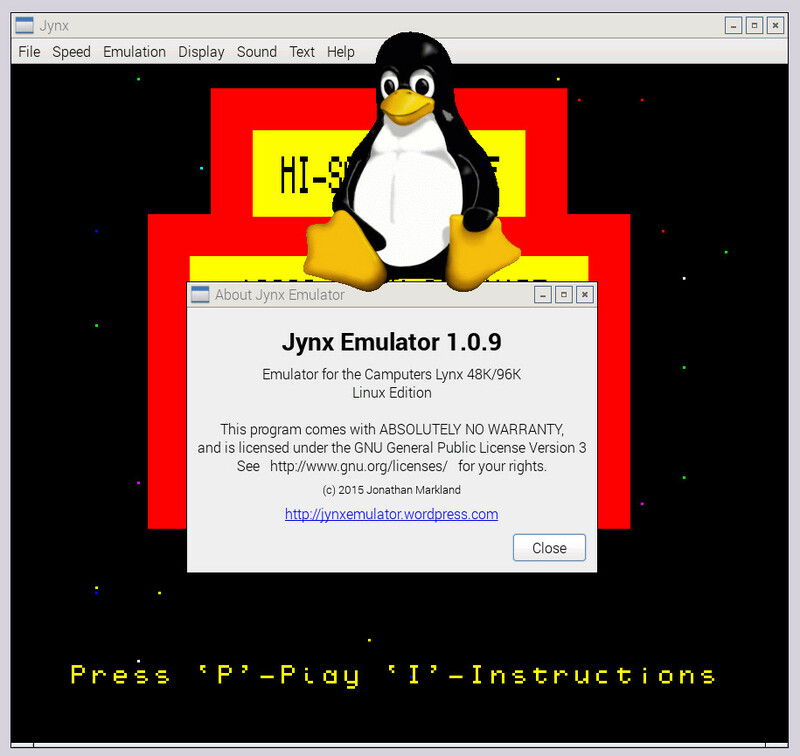 After no releases of Jynx for a while, I am now able to release version 1.0.9. I have only targetted the Raspberry PI 2 at the moment. I cannot confirm it will work on the ARMv6 Raspberry PIs yet. This will be followed in due course by version 1.0.9 for Microsoft Windows X86 32 and 64-bit, and 1.0.9 for Linux Mint 17.1, Elementary OS Freya, and will likely work on other “based on Ubuntu” editions of Linux. I will update this post when I am releasing those. This entry was posted in Uncategorized on July 7, 2015 by jynxemulator. 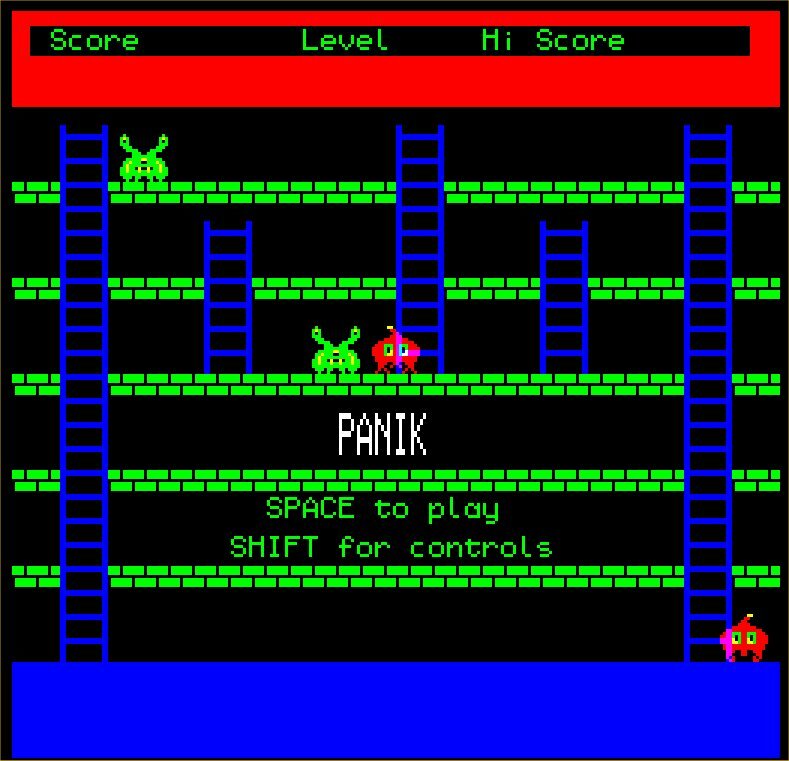 PANIK is unleashed everywhere – DOWNLOAD !!! 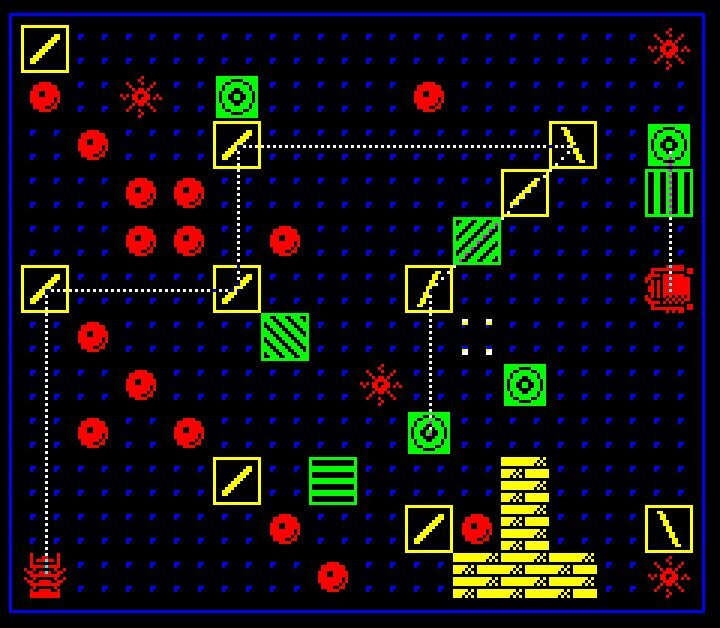 Recently I was contacted by Martin Judd, who wrote the computer game PANIK for the Lynx back in the 1980s. Cutting a long story short – the two of us have managed to rescue the game from some faulty TAP file images that were knocking around the internet. This entry was posted in Uncategorized on June 7, 2015 by jynxemulator. I am releasing a preview of my “Deflektor” clone for the Lynx 48/96. I have not had chance to do any work on this in the past couple of weeks or so, because I have been on other projects. Since I’m not sure when I’m going to be back on this, I am releasing a work in progress state snapshot of the game, that you can load into my Jynx emulator, click here to get it from my drop box. The less-than and greater-than keys rotate mirrors. Also I wanted to say “thank you” to everyone who takes the time to stop by and read my blog! People are visiting from Russia, Japan, Brazil, Spain, USA, and loads of places in Europe! This entry was posted in Uncategorized and tagged Camputers Lynx, Deflektor on October 30, 2014 by jynxemulator. This game writing business has taken a little more time that I had hoped! I lost time last weekend, after I decided to adjust my approach to the ray tracing. Originally, I did a ray tracing search at the resolution of the board squares. This returned a list of square centre positions, so I could draw the ray. This is what I showed in previous screenshots. This suffered subtle problems when the ray went off-screen, because the search terminated before the path stepped off-screen, so the user could not see where the ray ended up, it would just end at the final mirror! Also, to make the screen repaint handling easier, I decided I wanted to XOR plot the ray. This meant writing a line-drawing routine. I initially started a Bresenham algorithm, but abandoned this when I realised that rolling the search and line-drawing into one would be a great idea. The ray length exceeds the maximum allowed (overextension). The ray is directed off-screen. The ray hits a POD or an MINE. 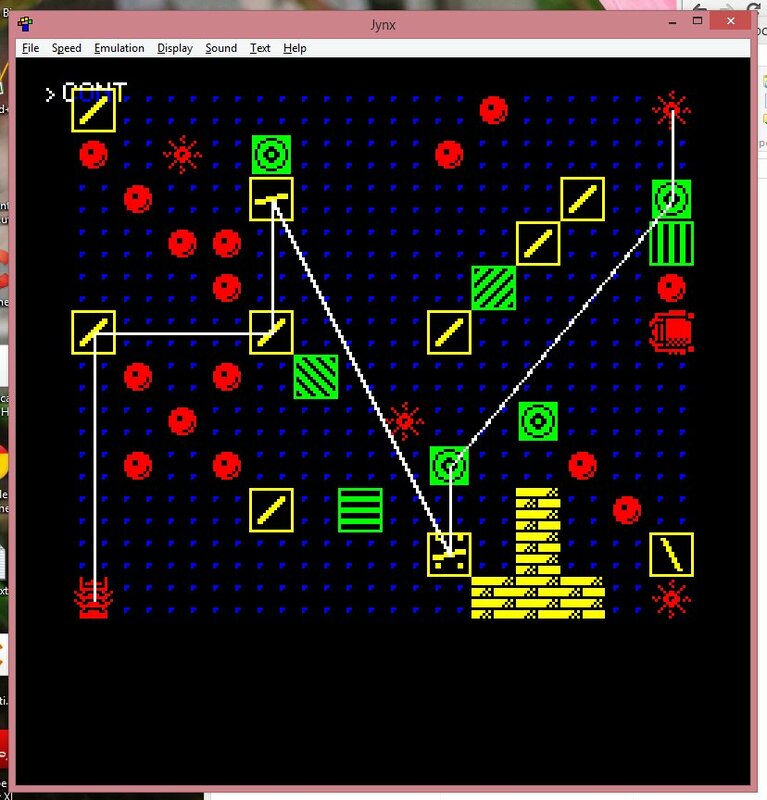 This is currently wrapped in a Lynx BASIC program that calls two assembly language modules, and I have a playable demo! Not everything is done yet – there are other objects I have yet to implement. This then needs wrapping with a title screen, scoring, energy loss, and so forth. … And I need some levels defining! This entry was posted in Deflektor on October 7, 2014 by jynxemulator. This entry was posted in Uncategorized on October 3, 2014 by jynxemulator.